The following two images are taken from the "New Topographical Atlas of Genesee and Wyoming Counties, New York. Philadelphia: Stone & Stewart Publishers. 1866". For more information on this "Ghost Town" see glimpse of St. Helena. 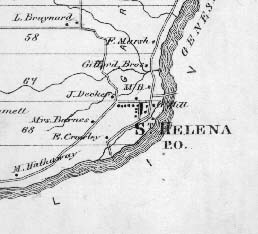 The map to the left shows the community of St. Helena and the surrounding area. The St. Helena Bridge is visible in the river just above the "mill". Below is a detailed map of the village along with its "business directory". 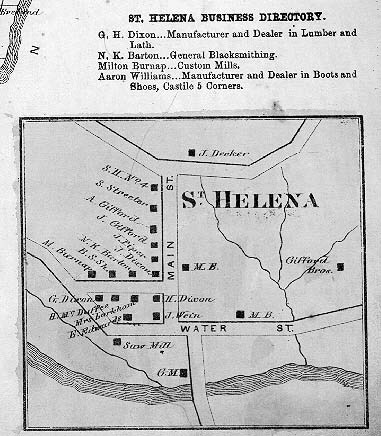 Both maps are part of the Town of Castile Map found on page 57 of the atlas.